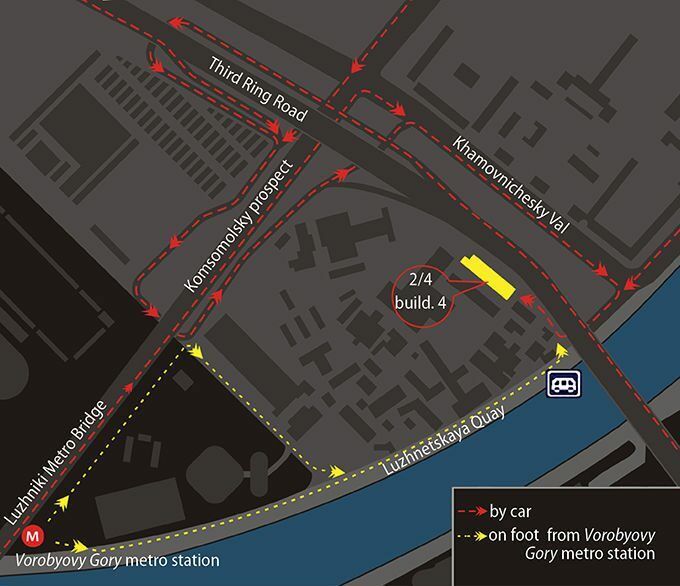 - The closest metro station is Vorobyovy Gory. - Leave the train and step on the elevator near the last car of the train (in the direction of Luzhnetskaya quay). - Exit the elevator and turn right. Exit the glass doors of the metro station and turn left. - Then walk along the metro bridge to the gate arm. - Pass it, and you will see the Olympic Committee building. Turn right towards the river. Reach the quay and turn left. - Walk down the quay. On the left you will see the Soyuz plant. There will be a number of gate houses along the way. Reach the last gate house (near the 3rd ring road). - Go through it and you will see a red brick building with a glass upper floor. - Go through the revolving door – welcome to the Art deco museum. - Turn on to the metro bridge from Vernadskogo Avenue and drive along it. - Then turn right onto Khamovnicheskiy Val street. - Turn right again in the direction of the quay. - Turn right once again, pass under the bridge and turn right at the nearest gate house. - The museum is located in a business center (a red brick building with a glass upper floor).